The Brunswick School Nutrition Program serves healthy, nutritious meals to students, staff and visitors in four locations. Each day over 1,000 meals are served. All school menus meet USDA requirements. All students have the option to purchase breakfast, lunch and milk. Elementary menus are sent home with students at the start of every month and are posted online. All menus must meet US Department of Agriculture standards, be highly acceptable for all students, be tasty, be served with a smile, and be prepared in a safe manner. Students are given choices for entrees at breakfast and lunch. Elementary teachers take a count each morning to see who is eating lunch, not to see who wants which meal. This way, students are free to choose any entree at mealtime. There is a salad bar with fruits, vegetables and condiments available at the food bar at the lunch line. Milk is offered with all meals – 1% white, skim, and skim chocolate. Children may buy lunch for $2.95 at Brunswick Junior High and High Schools, $.40 for reduced price meals (see below). All elementary school meals are $2.85 per student and $.40 for reduced price meals. Students may purchase a la carte milk for $.50. The cost of breakfast is $2.00 at the high school and junior high school, $1.75 for elementary students, for all paid students; breakfast is free for qualified free and reduced price students. If a child has a disability, as determined by a doctor, and the disability prevents the child from eating the regular school meal, the school will make substitutions prescribed by a doctor. If a substitution is needed, there will be no extra charge for the meal. Please note, however, that the school is not required to make a substitution for a food allergy unless it meets the definition of disability. Please call your child’s school for further information. K-5: Students in Grades K-8 are limited to $6.00 in charges before they will be limited to a sandwich and milk. Lunch: $2.85 (full) and $.40 (reduced). Milk: 1% white/skim or skim chocolate: $.50. Breakfast: $1.75. Staff and Visitors: $4.75 (adult portion). BJHS: Charges are limited to 3 lunches. Students are told verbally when the account is low at the point of service and notices are sent home once a week with any student with a low balance. Parents may call their child’s school any school day to find out this balance. Lunch: $2.95 (full) and $.40 (reduced). Milk: $.50. Breakfast: $2.00. BHS: Students may use their PRE-PAY Account or cash. The more students who use the pre-pay accounts, the faster the lunch line moves! There is no borrowing meals at BHS. Students are told their balance at the register after each transition and the responsibility belongs to the student to keep the parents informed. Parents may call any school day to find out this balance (319-1916). Lunch: $2.95 (full) and $.40 (reduced). Milk: 8 oz. bottles of 1% white, 1.5% chocolate/strawberry/skim: $.50. Breakfast: $2.00. GENERAL: The best deal is a Value Meal which includes choice of entree, fresh vegetable, fruit, dessert when available, and 8 oz. milk or juice. This is priced at $2.95 at BHS and BJHS. Purchased separately (a la carte style), the cost is much higher. There is no Value Meal at both elementary schools. ATTENTION PARENTS: We send notices home with students who owe money on their lunch accounts. We allow students to “borrow” 2 meals (to owe $5.90 max). After this maximum has been reached with no payment made, your child may receive a cheese sandwich and a milk (or juice) ONLY, until the account is paid in full AND there is money available in the account. The lunch account system is a debit system, NOT a credit card-type system. There must be money available on the account to ensure there is no hiccup in your child’s lunch service. Please feel free to call or e-mail anytime to request a balance update on your child’s account status. All menus and foods served in the Brunswick schools are regulated by the United States Department of Agriculture, the Maine Department of Education, and the Maine Department of Health and Human Services. Approved software takes into account the ingredients, the recipes, and the serving size, and also determines what the average serving contains. The guidelines are determined by the age of the students in each school. The Brunswick School Department offers a choice of healthy meals each school day. Children may buy lunch for $2.95 at the junior high and high school; $.40 for reduced price meals. All other elementary school meals are $2.85 per student and $.40 for reduced price meals. Students may purchase a la carte milk for $.50. Breakfast is $2.00 at the high school and junior high school, $1.75 for elementary students for all paid students; breakfast is free for free and reduced price students. All meals served must meet nutrition standards established by the U.S. Department of Agriculture. If a child has a disability, as determined by a doctor, and the disability prevents the child from eating the regular school meal, the school will make substitutions prescribed by a doctor. If a substitution is needed, there will be no extra charge for the meal. Please note, however, that the school is not required to make a substitution for a food allergy, unless it meets the definition of disability. Please call the school for further information. 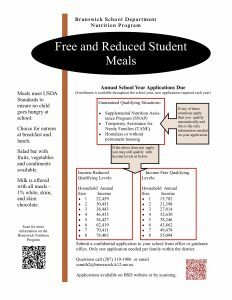 Your child can get free school meals if you get food stamps, Temporary Assistance for Needy Families (TANF) or benefits from the Food Distribution Program on Indian Reservations (FDPIR). If your total household income is the same or below the amount on the Income Chart (click here to see chart), your child can get meals either free or at a reduced price. Households getting food stamps, TANF, or benefits from FDPIR. You only have to include your child’s name and case number, and an adult household member must sign the form. Households that do not get food stamps, TANF, or benefits from FDPIR. If you do not have a case number, you must include the names of all household members, the amount of income each person got last month and where the income came from. An adult household member must sign the form and include the last four digits of his/her social security number, or indicate that he or she has none. How do I get free or reduced price school meals for my child? You must complete the Free and Reduced Price School Meal Application and return it to your child’s school. Families may apply for free & reduced school meals at any time. Will this form be verified? Your eligibility may be checked at any time during the school year. School officials may ask you to send written evidence that shows your child should get free or reduced price school meals. Can I appeal the school’s decision? You can talk to school officials if you do not agree with the school decision on your form. You also may ask for a fair hearing by calling or writing to: Greg Bartlett, Assistant Superintendent, 46 Federal St., Brunswick ME 04011 (phone: 207-319-1900). Will information on my form be kept confidential? We will use the information on your form to decide if your child should get free or reduced price meals. We may inform officials connected with other child nutrition, health and education programs of the information on your form to determine benefits for those programs or for funding and/or evaluation purposes. Can I apply for free and reduced price meals later? You may apply at any time during the school year. If you are not eligible now but have a change, like a decrease in household income, an increase in household size, become unemployed or get food stamps, TANF or benefits from FDPIR, complete a form then. A note from Scott Smith, Food Service Director: With current national attention being focused on children’s health and wellness issues, the Brunswick School Department’s Food Service Department is excited to provide you with a convenient, easy and secure online prepayment service to deposit money into your child’s school meal account at any time. This service also provides the ability to view your child’s account balance through the Brunswick School Department’s webpage called MySchoolBucks.com. Having money in your child’s account prior to entering the cafeteria ensures that the lunch lines move along much faster so your child has more time to eat and be with friends. Also, you can print out a copy of your child’s eating history report, which will show you all dates and times that your child has purchased breakfast/lunch within the past 30 days. We are very pleased to offer this service, in direct alignment with the Brunswick Strategic Plan/Safe and Healthy Environments priority, and are confident this system will benefit you, your child, and our Brunswick schools. However, if you choose not to take advantage of the online prepayment service, you may make advance payments via check (see payment information below). Online Registration: This allows parents to deposit money, to check account balances, and to view meal purchases. To Register: Go online and open “MySchoolBucks.com”. Click “Register for a free account” and enter the required information. Click “finish” to complete the initial registration process. 1. Create a user profile by clicking on the Start Here button on the home page. 2. Add students to your household – you’ll need the child’s name and birth date and student ID (Note: student ID may be optional depending on the school). 3. Now you’re ready to make payments! Pre-Pay Accounts: All students and staff have a pre-pay nutrition account. Parents are expected to make a deposit using the envelopes provided in the lobby of each school each time your child purchases a meal. You can also deposit more money on your child’s account and a notice will be sent home when your child has reached a negative balance. The account is only charged if your child takes the meal or item. If he/she doesn’t eat, there’s no charge. Account Deposits: Deposits to the account should be made by check or cash in the BSNP envelope with the date of the deposit, student name, grade, and the amount enclosed, by 9:00 a.m. Checks should be made payable to BSNP. All returned checks may be charged a fee of $20.00 from the student’s account. Point of Sale System (POS): When students enroll in any Brunswick school, they are given an ID number with their picture and district ID number on it. It is important that each student keep his/her ID card as it will be used daily for meals. If a student loses or damages his/her card, there is a $1.00 charge to replace it. Student Charging: Twice each week bills are sent home with any student with a negative balance. BHS students may not charge at all. Students will be told in line when their account is below $2.00. Students may check their account balance after every transaction at the register. You may call the kitchens to inquire about your balance between 8:00 and 10:00 a.m. or 12:30 until 1:30 p.m. No child will go hungry. How Is The Money Handled? : Students should drop off prepayments in the school lobby any morning. Prepaying for meals by check is highly recommended. Checks must be made payable to BSNP and include the student’s first and last name. No change will be given to students. Any cash prepayment must be put in a deposit envelope with the student’s first and last name and amount. Money left at the end of the year will be carried into the next year. Refunds will be made for students leaving the district. In order to speed up service in the cafe, it is encouraged to prepay each Monday for meals to be eaten during the week or longer. The account is only charged if a student takes a meal.